The EasyDry robot is designed to dry every part of a vehicle that has been painted as well as individual parts on stands. 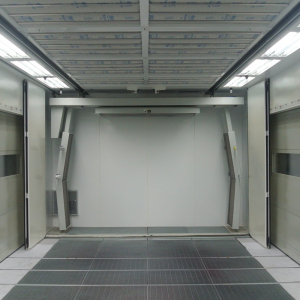 It is normally installed inside a spray booth for drying waterborne/ solvent basecoat and clear coats. The EasyDry is composed of one overhead crane and three groups of radiant panels. 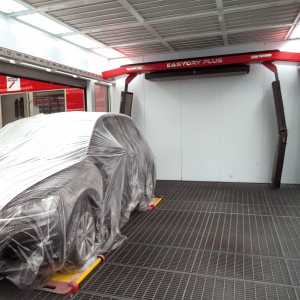 This allows it to dry paint using its radiant waves on every side of the vehicle as well parts on stands. The horizontal group of radiant panels moves automatically up and down to meet the right distance and the shape of the vehicle and spare parts. 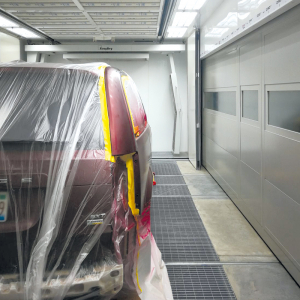 It moves the radiant panels along the length of the spray booth spreading out DryTronic waves at a 180°angle to the surface of the painted vehicle. 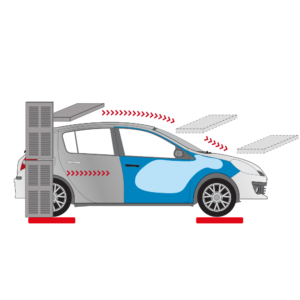 The EasyDry robot has one limitation: it cannot dry bumpers that are installed on the vehicle. The horizontal group of panels on the robot cannot rotate 90° to be perpendicular to the bumpers. This represents an issue only when the repair center doesn’t remove bumpers for painting. When it is necessary to paint bumpers installed, the RoboDry is the right model of robot for that repair process. 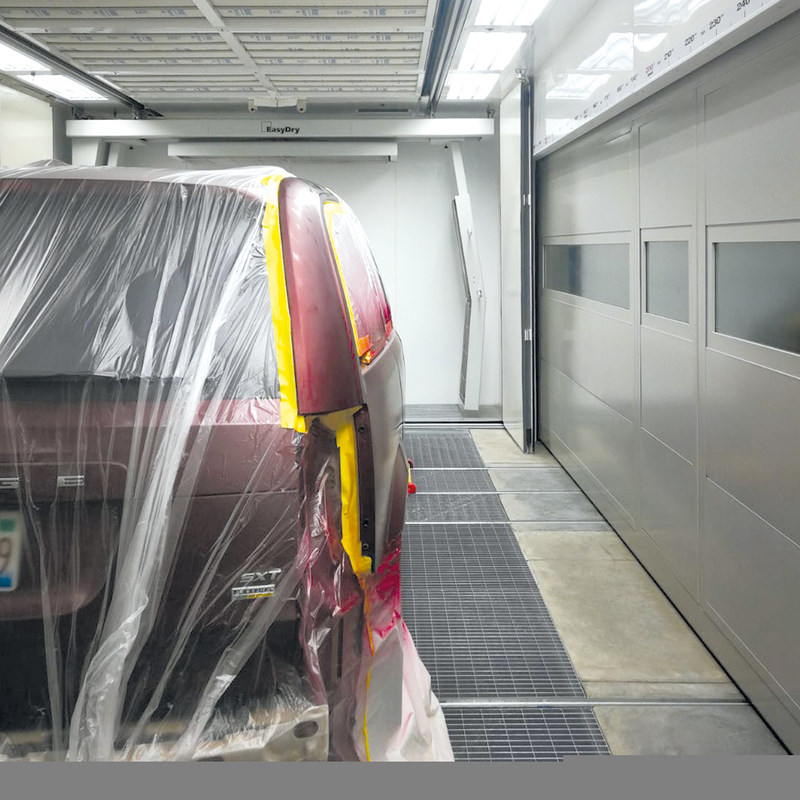 The EasyDry robot has a built-in database of formulas for drying any automotive paint manufacturers waterborne/solvent basecoat and clear coat systems. The technician selects the brand and paint system to be applied. The robot then automatically manages the drying treatment for distance, color, paint thickness and climate. The automatic adjustment and control of the treatment are based on a built-in laser that constantly reads the quality of the drying process. In new projects Symach normally installs two EasyDry robots inside a FixLine KombiTron system. One is installed in the spray booth for the basecoat; one is installed in the drying cabin for clear coat. 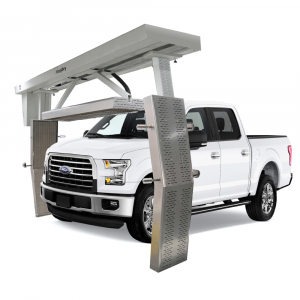 Inside the drying cabin, there are two additional groups of DryTronic radiant panels (one in the front and one in the back) for drying bumpers installed on the vehicle, or spare parts on stands. The EasyDry robot dries any and every brand of paint, primer, and body filler. The drying speed is around 80 cm or 32 inches per minute. For example, it dries the length of a vehicle’s door in less than two minutes, or a paint job of 3-4 panels in 8-10 minutes. 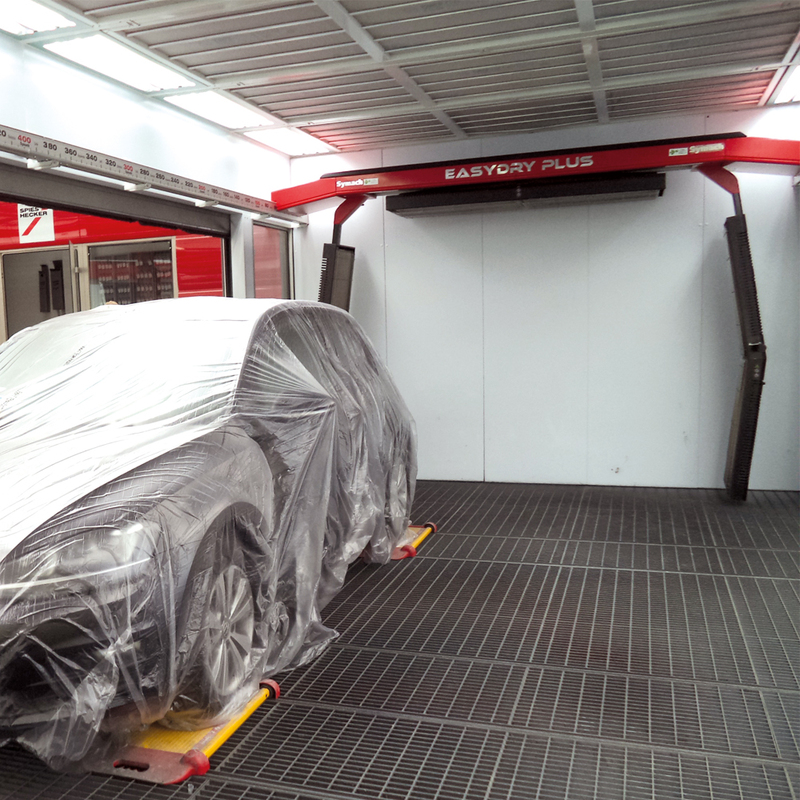 Since EasyDry consumes approximately 10% of the gas than a normal spray booth the reduction in drying cost is one of the many advantages. booth with side pneumatic doors and rails with a CarMover for pushing vehicles in and out of the booth, which takes only a few seconds. 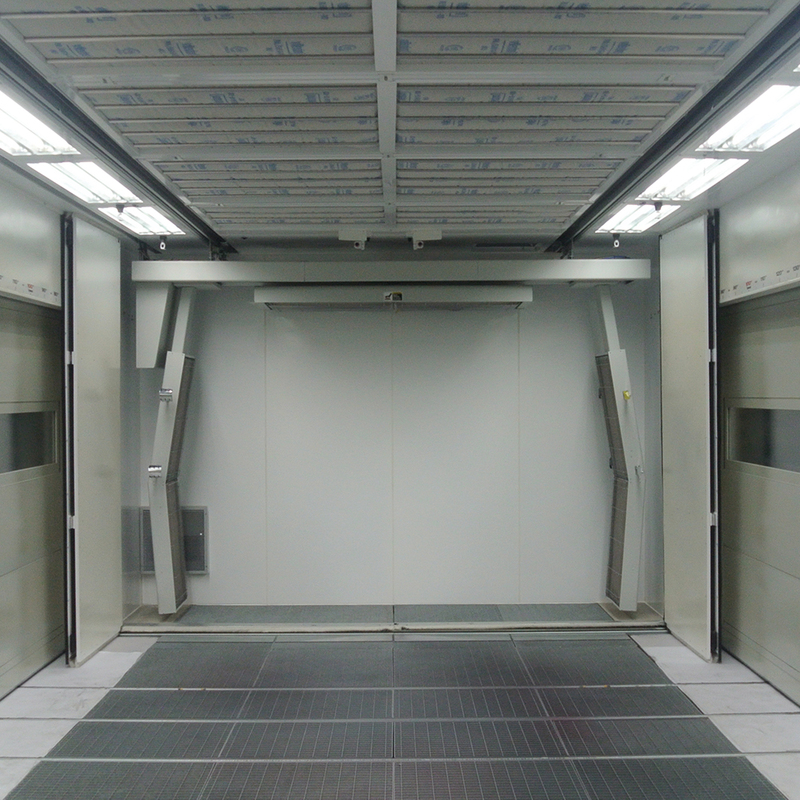 other spray booths on the market. 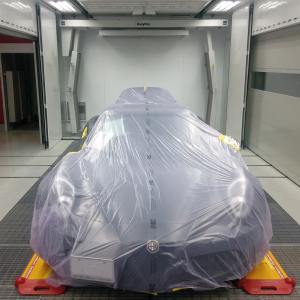 The EasyDry is a robot that dries the paint as it moves along the surface of the painted vehicle. The drying time is measured in centimeters or feet per minute. Depending if the technician uses the hardener – fast, standard or slow – the drying time is: Sealer / from 100 cm or 39 ” per minute, to 90 cm or 35 ” per minute. Waterborne / from 120 cm or 47 ” per minute, to 80 cm or 32 ” per minute. Clear / from 90 cm or 35 ” per minute, to 60 cm or 24 ” per minute. As an example, it takes less than two minutes for the clear coat to dry on an average door. The EasyDry has a multi-language keyboard and a display located on the tower outside the spray booth. The painter can choose to enter a different start and finish point of drying for every DryTronic group of radiant panels. The painter selects the brand and paint type applied. The computer has predefined drying formulas for all paint types. The robot automatically determines the speed, temperature and distance from the surface; however, the system can be modified for special situations. The software automatically manages the “Drying Quality Control” during all phases of drying treatment, adjusting the intensity and quantity of the DryTronic waves to properly meet the parameter of the drying formula, for perfect drying. 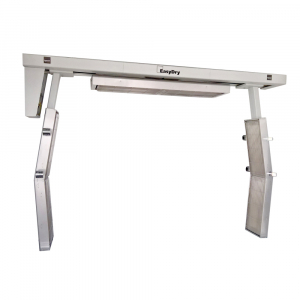 The overhead crane of the EasyDry is the support of the three groups of DryTronic radiant panels. It moves along the spray booth supported by two aluminum rails. Inside the overhead crane, there is an electric engine that moves the robot. In addition to the electric engine, it also houses the gas and air systems. 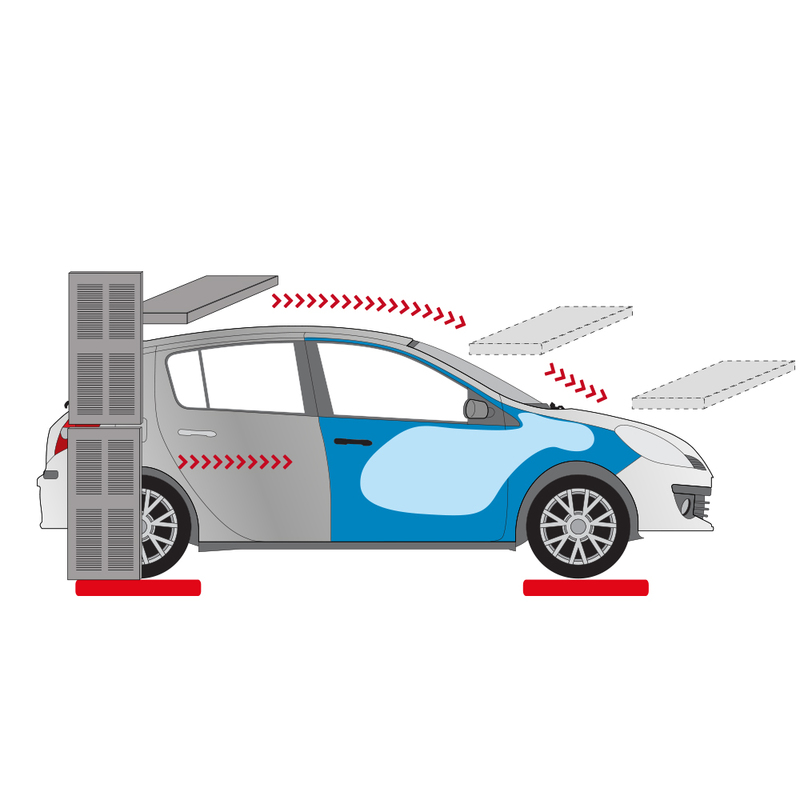 The EasyDry features an LLS (Laser Level Shape) system that detects varying vehicle and/or object heights. As the laser moves along during the drying process, it sends the dimensional data to the computer. The LLS system then automatically moves the horizontal lamp up and down adjusting to the appropriate height. For example, the transition from vehicle roof to vehicle hood.